Returning to my German Lutheran ancestry is the intention of this trance journey. It is an inquiry into the margins of male based religious familial traditions. The trace of my heritage that I took with me as a guide was the Lutheran Hymnal, given to me by my father on my 14th birthday. Drawing upon the oracle of the songs I was returned to a time of humble beginnings. I was welcomed by my early ancestors and offered an ascendant experience, that was a remembering, of the deeply communal relationships that shape spiritual experiences and understandings. My ascension was not a miracle but result of the supportive and connected community creating an energetic container for an/other. Ancestral Journey VII _ Bickel from Barbara Bickel on Vimeo. this documents a journey to explore my spirituality as a woman in the land of west coast canada i've migrated to.i invoke my maternal great grandmother and grandmother to wit(h)ness and accompany my new grandmotherhood. they come with kindness and generosity reaching back to primordial roots where everything on this earth, our home and our transformation, starts from. My older sister was born on July 25, 1942. She died of breast cancer on November 16, 2006 at the age of 64, three years younger than I am now. My grieving process continues as I seek to dissolve the mystery woven through our matrixial threads holding us to our genetic patterning. This loss weighs heavily on me. My Lammas journey offered an opportunity to bring some deeper clarity to the painful question - how did our life choices mold our life journeys into such different endings? My breast cancer was diagnosed in 1992, hers in 1995. We are sleeping in a hotel in Ulm, Germany—for the first time in months the waving, rocking feeling of my body has settled. Waking up, I feel still at last. I love this small city of “Ulm.” The day before we sat on a soft grassy river-side of the Danube. Chris was swimming there, and I felt so relaxed, so relaxed. There is a huge famous Gothic Cathedral here that we visited. 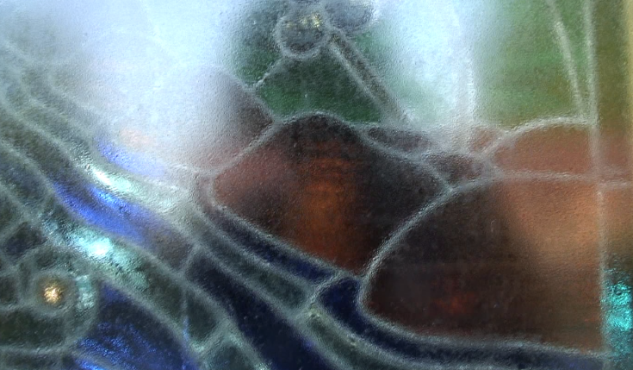 Its stained-glass windows are a marvel of medieval imagination. Its tall spires are a testament to the spirit of human endeavour. Inside all is soaring upwards to the sky. There are wood-carvings of medieval people, made into stories that line the back benches. All these cathedrals of Europe amaze me. They are stone temples of the soul that express a human yearning to embody heaven and earth. Such places/spaces merge life and love with creator/creation and art. I feel moved beyond, yet more and more myself. I awake from my sleep with a vision/feeling of my paternal grandmother’s house—a person and house I love and always felt safe with/in. This was the little cathedral of my own soul—her brick bungalow home. I feel myself in this place. I feel held and loved. I miss this space and place, and yearn for it. Yet I know I will not ever stay with her there again since her death and the sale of the house. But I go there in this vision, feeling a comforting presence of love—there is the subtle smell of roses, or is it her Pond’s cold cream. Danaan C-J (2012). Nané sitting by the Danube—Ulmer Munster spire visible across the river. Nané Jordan (2010). Grandma’s house. East York, Toronto, Ontario.